The Cupcake Crusaders have gone international! Well, sort of… If you consider an eight hour drive to Canada international, then yes, we have gone international. Last week my hubby and I returned from our anniversary trip to Ontario. We stayed in Beamsville, Ontario, at Cottage by the Lake and had such an amazing time. Since we were about an hour away from Toronto, and had our five month old puppy with us, we were only able to visit Toronto for a few hours. We visited the CN Tower, St. Lawrence Market, Steam Whistle Brewery, and of course, a cupcake shop. 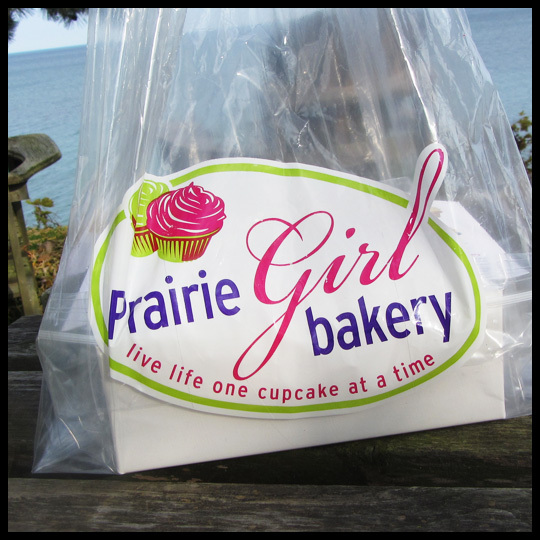 Since all our points of interest that day were in walking distance, I selected Prairie Girl Bakery. It’s just a few blocks from St. Lawrence Market so was conveniently located on our walk back to the CN Tower. I didn’t have a lot of time to research cupcake places in Toronto, and knew since we wouldn’t be there for long I couldn’t be too picky, so since this was the closest place I went with it. The only thing I knew from their website was that they had both full size and mini cupcakes in each flavor. I was pretty excited about that since mini cupcakes mean you can try more flavors without feeling guilty. When I got there I discovered that they have a very structured menu. Basically, you’ve got your vanilla cake options, your chocolate cake options, your specialty cake options (red velvet, carrot cake, and banana cake), and then a “Treat of the Week.” The vanilla cake options are topped with either: vanilla, chocolate, strawberry, lemon or vanilla with toasted coconut frosting. 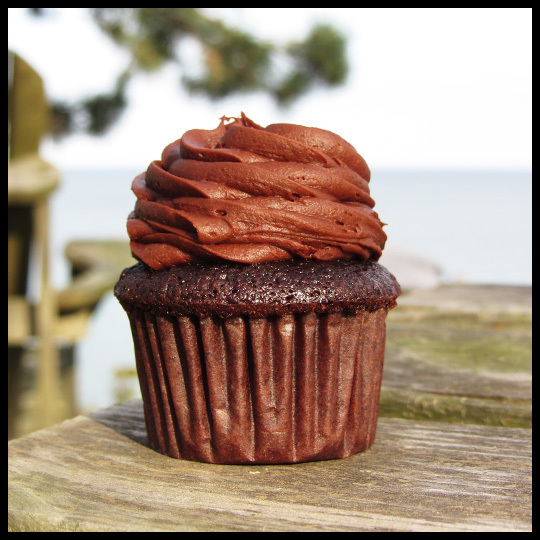 The chocolate follow a similar pattern and are topped with vanilla, chocolate, strawberry, peanut butter or peppermint frosting. I decided to get a 1/2 dozen of the mini cupcakes since I knew I would be hopefully making other cupcake stops later that week. I first asked my hubby what flavors he would like and told him he could pick three (I figured I should share since I dragged him in there) but he only wanted two: Chocolate/Chocolate, and Chocolate/Peanut Butter. So for my final four I selected: Chocolate/Peanut Butter (I wanted one of my own), Banana/Peanut Butter, Banana/Chocolate and their Treat of the Week: Cookies and Creme. I didn’t really want the Cookies and Creme, what I really wanted was Carrot Cake, but they were out of it. I really love Carrot Cake and the cream cheese frosting that usually accompanies it, so I was pretty bummed out. Looking back, I just should have gotten the Red Velvet so I could have at least tried the cream cheese frosting. Once we got back to our cute cottage situated directly off of Lake Ontario, it was time for some tasting (and a quick “photoshoot’)! For the purposes of this review, I’m going to start with our least favorite so you leave you dreaming about our most favorites. Unfortunately this “Treat of the Week” wasn’t much of a treat for me. While the frosting appeared to have cookie bits in it, all it tasted like was confectioners sugar. I was really disappointed, especially since this was my replacement to the carrot cake that I really wanted. I was so unhappy with it that I couldn’t even finish the frosting on this cupcake, even though it was a mini one (so glad I didn’t have a full size one!). 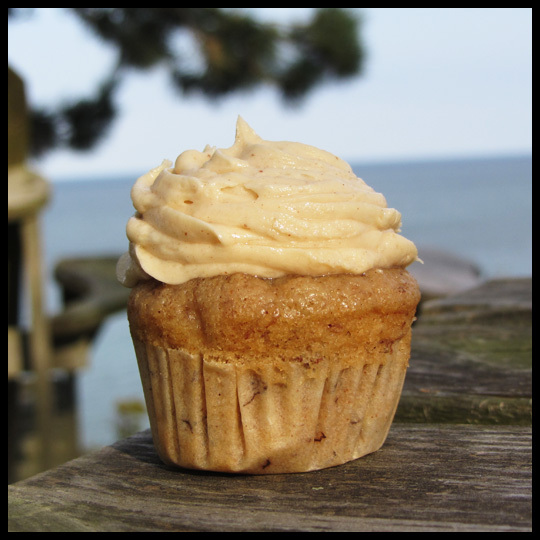 I love the combination of peanut butter and banana’s together so I was really excited about this cupcake. The banana cake was really amazing. It was moist with chunks of fresh banana. Unfortunately the peanut butter frosting wasn’t what I was expecting. 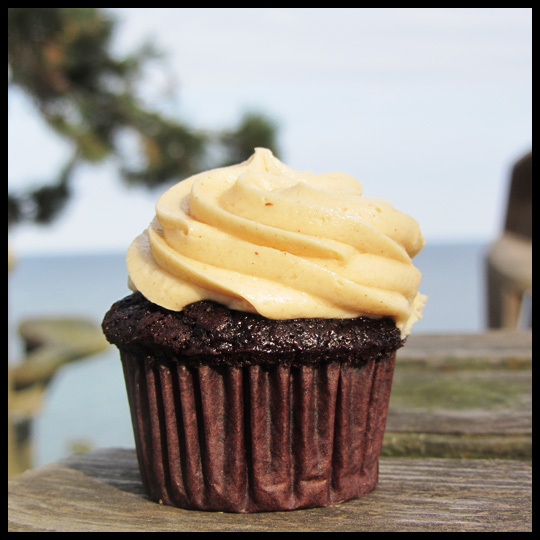 For me, it was way too sweet and lacking the saltiness that I typically love when you get a peanut butter frosting. Otherwise, it was nice and creamy and I did finish the whole thing despite the frosting being on the sweet side for me. Since I had already had the Banana with Peanut Butter frosting, I knew what I was getting from this. I would say that it was a tie between this one and the banana one. I really loved the rich, moist chocolate cake, but the frosting again just wasn’t working for me. I still ate the whole cupcake though (so it was good, just not GREAT). This was my hubby’s selection and he couldn’t have been more pleased with it. I think he wished that he had a full size cupcake instead of the mini one (sorry hubby!). Of the trip, this was his favorite cupcake. He didn’t try all the ones I had gotten, since he only likes certain flavors, but if we are fortunate enough to make it back to Toronto one day, I have a feeling we will be stopping into their bakery for this cupcake. 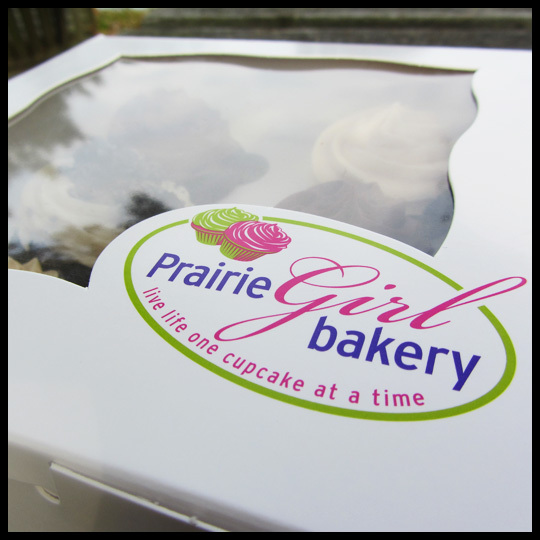 This was definitely my favorite of the five flavors we choose from Prairie Girl Bakery. 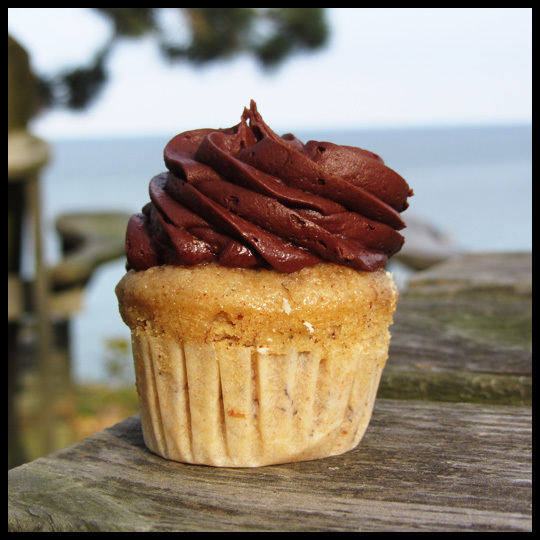 The amazing banana cake paired with their luscious and smooth chocolate frosting where the perfect combination. I would have to say that this ranks up there with my other favorite banana chocolate combo from Fancy Cakes by Leslie. Overall, while I wasn’t “wow’ed” by some of their flavors, their cake is really wonderful, and their chocolate frosting is superb. 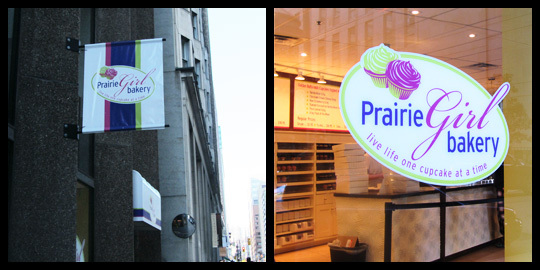 They now have two locations in Toronto (the 2nd location just opened today! ), both not far from each other or Union Station, so if you are ever in the area, you can quickly pop in for an morning, afternoon, or evening treat. But take my recommendation, stick with the chocolate frosting, you’ll be very happy that you did. 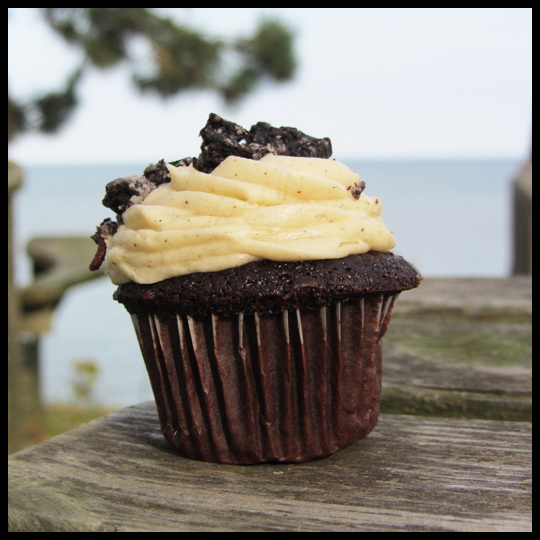 This entry was posted in Canada, Cupcakes, Ontario and tagged banana, Canada, Chocolate, cookies and creme, Cupcake, Ontario, peanut butter, Prairie Girl Bakery by Stacy. Bookmark the permalink. LOVE these photos!!! What a beautiful location and such yummy looking cupcakes! The Banana Peanut Butter one looks right up my alley. Thanks for visiting Toronto! Too bad you didn’t try other cupcake shops in the city. Praire Girl really ranks low compared to The Wedding Cake Shop, Dlish Cupcakes and Bobbette & Belle. I’m not a big fan of places like Praire Girl that use the same cake and just change up the frosting. Hi Anne! Thanks for reading our review! And thank you for the recommendations. We only had a couple of hours in Toronto, so I basically picked the cupcake shop closest to where we would be in the city. 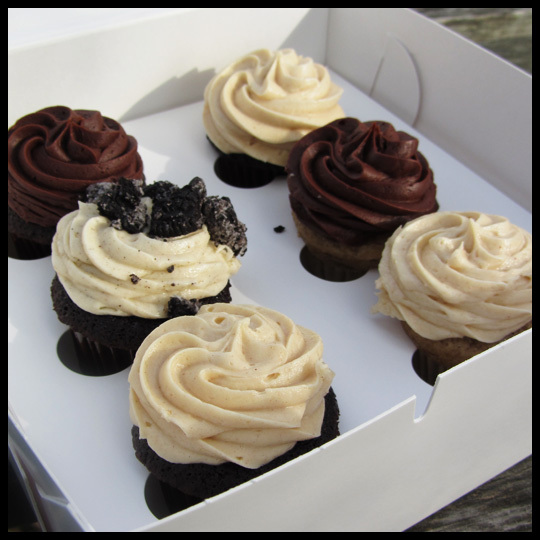 Next time I hope to spend more time in Toronto and explore some more cupcakeries. I agree with you on the same cake thing. I like fun, exciting cupcakes, so this left me wanting more. I do have to say though, it wasn’t a total waste of a trip becuase their chocolate/chocolate still remains as being my husband’s ultimate favorite chocolate cupcake. We hope you continue to follow our blog and please always feel free to continue making recommendations! Here’s some interesting details on the PG cupcakes. All I can say is holy smokes!! Hi Janet! Thanks for reading the blog! My husband and I luckily tried the mini cupcakes which are “only” 190 calories and 8 grams of fat. I can’t even remember how large the normal sized ones were since we didn’t take any back to our cottage with us. I thought the mini’s were the perfect size though, and clearly a WAY better option to the full size cupcakes. Thanks for sharing!